and are "Double Crossing" and are walking back to the south end of the Mighty Mac. The Mackinac Bridge Walk has been held every year since 1958. 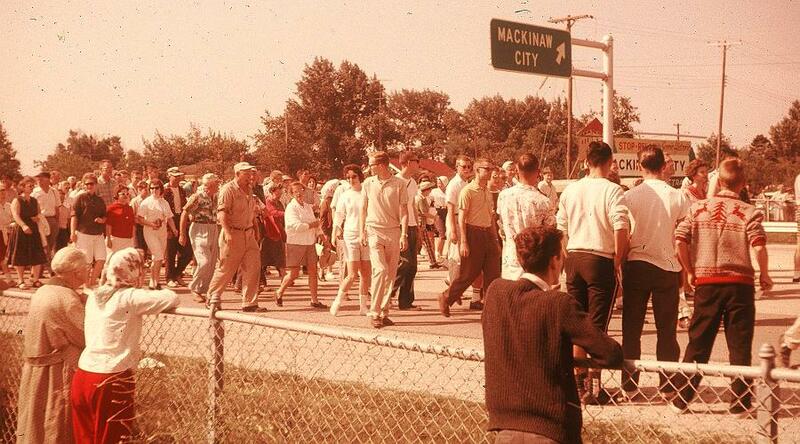 The first bridge walk during the Bridge's Dedication Ceremony in June, 1958 and only 68 people walked across the Mackinac Bridge that year. The walk has been held on Labor Day every year since 1959. Most years, the Michigan Governor leads off the start of the Bridge Walk and President George H. W. Bush led the walk in 1992. Few changes are planned for the 2019 Mackinac Bridge Walk. This page will me updated if changes are announced. For the present time, this is the best information of what to expect in 2019. People can begin the 2019 Mackinac Bridge Walk anytime between 7AM and 11:30AM, and walk as much of the bridge as they are able to do before the bridge reopens to traffic at noon. New since 2018, people can now start their Mackinac Bridge Walk from either end of the Mighty Mac and there are no busses traveling across the bridge during the walk. The new rules mean that even though the walk ends at noon, people can walk at least a little of the bridge, as long as they arrive before 11:30AM. Some people start at 7AM and walk all the way across the Mackinac Bridge and back to where they started (10 miles). They call themselves "Double Crossers" and many buy "Double Crosser" T-shirts. Many walk all the way across one way, either having arranged to get to the far side of the bridge before the walk, returning by way of Mackinac Island, or returning after the bridge reopened to traffic. Other people walk part way across (perhaps the middle) and back. If new options are announced, they will be added to this page. Walkers wishing to walk all the way across the Mackinac Bridge must reach the midpoint by 10AM. The same applies to walkers walking all the way across and back again. Starting at 10AM, the turn around point starts moving from the center toward each end, so that people have time to return to the end they started from. No one can begin their walk after 11:30AM. People who have never walked the bridge because of physical limitations, or fears of the highest suspended middle, ware finally able to experience being on the bridge. Some may only go a few hundred yards, while others walk a mile or more, knowing they can turn around before reaching their limit. Mackinac Bridge walkers park on the streets near the foot of the Mackinac Bridge in Mackinaw City, or park in downtown St. Ignace to take a free shuttle from Little Bear Arena to the walk. This shuttle operates from 6AM - 1PM. To manage the thousands of people who walk the bridge, the following are NOT permitted: smoking, signs, banners, umbrellas, bicycles, roller skates, skateboards, wagons and other similar devices. Baby strollers and wheelchairs are allowed on the bridge during the walk. The ONLY animals permitted are working service dogs. There are no rest rooms on the bridge, but there are huge banks of portable toilets at both ends. Although the walk can be completed in about an hour, the typical walk all the way across, or to the half way point and back, will take about 90 minutes to 2 hours. No running or jogging is permitted. 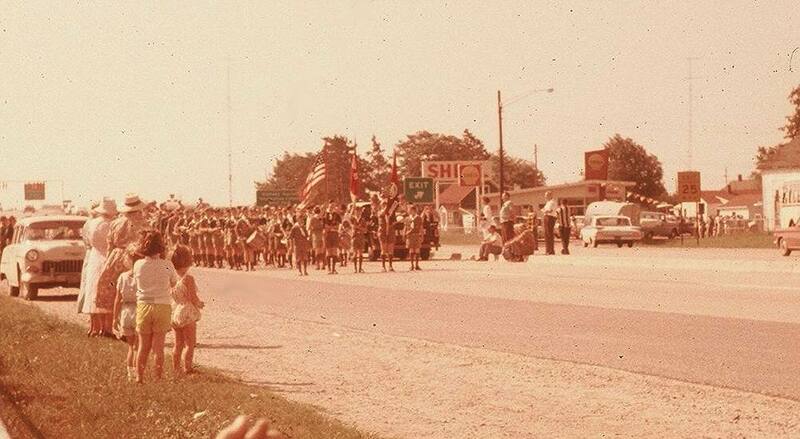 For many years, there was a walking race at the beginning of the Mackinac Bridge Walk. Competitors were required to walk heal to toe and running or jogging could result in a disqualification. The mightymac.org Webmaster competed in the walking race in 1967 at age 13 and finished 5th in his age group with a time of about 56 minutes. More recently, there is a Labor Day Run for runners and wheeling athletes which begins from the north end of the Mackinac Bridge at 6:40AM. Athletes must be able to complete each mile in 12 minute pace or less. The charge is $58.30 until February 28, 2019, $68.90 until May 31 and $79.50 Registration for the Labor Day Bridge Run. The run is limited to the first 700 people to register. Registration includes bus transportation from the Mackinaw City Recreation Center to the starting line on the bridge prior to the run, a technical tee shirt, finisher medal, finish line photos and a custom bib. PRIVATE TRAFFIC: From 6:30AM - Noon, Northbound I-75 traffic will be stopped at Exit 337 on the south end of the bridge; southbound US-2 and I-75 traffic will be stopped at Exit 344 on the north side. Mackinac Bridge Authority mechanics will patrolled to assist motorists with vehicle problems. For people who want to do the entire walk one way, Star Line Ferry provides pedestrian ferry departures between Mackinaw City and St. Ignace. In 2018 they departed from each city on the hour at 6AM, 7AM, 8AM, 9AM, 10AM and 11AM. The 2018 cost of this service was $20/adult and $12/child (ages 5-12). The Mackinaw City dock is a bit over 1/2 mile from the foot of the Mackinac Bridge and there will be a free shuttle between the north side of the bridge and near the St. Ignace dock. Your spot is not reserved, boarding is in the order people arrive at the dock. There are similar plans for 2019 and they will be posted when we are closer to the event. Shepler's Ferry also provides pedestrian ferry departures between Mackinaw City and St. Ignace. In 2018 they departed from Mackinaw City at 6AM & 7AM and from St. Ignace at 6:30AM. These will have reserved boarding. The 2018 cost of this service wa $20/adult and $10/child (ages 5-12). The Mackinaw City dock is about 5 blocks from the foot of the Mackinac Bridge and there will be a free shuttle between the north side of the bridge and a location 2 blocks from the St. Ignace dock. Details will be posted when we are closer to the event. Both ferry lines also provide the option of taking a ferry to Mackinac Island from one of the two mainland communities and then taking a 2nd ferry to the other community. Many people taking this option take the ferry after their Mackinac Bridge Walk and spend some time on Mackinac Island before taking the second ferry. Shepler's Ferry's first 2018 departure from Mackinaw City was at 5:30AM with a connecting ferry from Mackinac Island at 6AM. The first departure from St. Ignace was at 6:30AM with a connecting ferry from Mackinac Island at 8AM. Departures continue until evening. 2019 schedule to be determined. Tickets purchased online in advance are $24/adult and $13/child (ages 5-12). The Mackinaw City dock is about 5 blocks from the foot of the Mackinac Bridge and there will be a free shuttle between the north side of the bridge and a location 2 blocks from the St. Ignace dock. Star Line Ferry's first 2018 departure from each community was at 7:30AM with connecting ferry from Mackinac Island at 8AM. Departures continued until evening. 2019 schedule to be determined. Tickets purchased online in advance are $24/adult and $13/child (ages 5-12). Tickets for select departures on the much slower "Historic Classic Ferries" are $19/adults and $10/child. The Mackinaw City dock is a bit over 1/2 mile from the foot of the Mackinac Bridge and there will be a free shuttle between the north side of the bridge and near the St. Ignace dock. New since 2017, Michigan State Police provide security for the Mackinac Bridge Walk. match a prize number on display in one of the store windows in Mackinaw City or the City of St. Ignace on day of event. Different certificates are given out at both ends of the Mackinac Bridge and "Double Crossers" get both. There is no charge to walk the Mackinac Bridge. Walkers may start walking beginning at 7AM. Buses will start picking up those who have not completed the walk, working out from the center of the bridge, as noon approaches. Walk only. No running, jogging, etc. Only official vehicles will be permitted on the Mackinac Bridge between 6:30AM and Noon. No private traffic! Baby strollers and wheelchairs are allowed on the bridge during the walk. There are no rest rooms on the Mackinac Bridge. There are portable toilets at both ends of the bridge and at the shuttle loading area. NOT PERMITTED: smoking, signs, banners, umbrellas, bicycles, roller skates, skateboards, wagons & similar devices. You will receive a numbered Mackinac Bridge Walk certificate at the completion of the walk at either end. The number on your certificate may match a prize winning number on display in store windows in Mackinaw City or St. Ignace on the day of event. Wear layers. It may be cold at the start of the walk, but much warmer before you finish. People walking all the way across the Mackinac Bridge must reach the midway point by 10AM, or they will be turned back to the end they started from. Those who need reasonable accommodations due to disability may contact the Mackinac Bridge Authority by September 1, 2018 at (906) 643-7600. TTY users may call the Michigan Relay Center at (800) 649-3777. Details of how to sign up for text updates will be provided in advance of the 2019 bridge walk.